The Nest lived up to its reputation — a building where anything can happen and usually does — once again on Thursday, but on this night Montana had all the answers and walked out with an 88-86 double-overtime victory over Sacramento State. 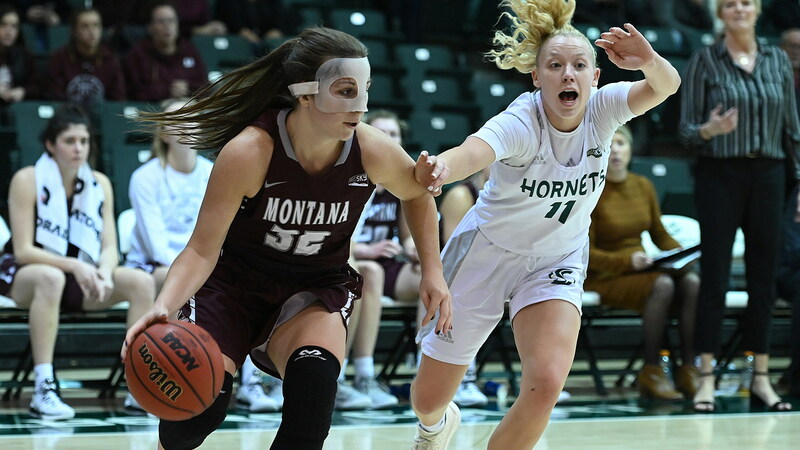 The win snapped Montana’s five-game losing streak on the Hornets’ home court and more importantly kept the Lady Griz (8-4, 3-0 BSC) unbeaten three games into their Big Sky Conference schedule. “I’m just elated at how these guys gutted it out and got it done. What a battle by the girls,” said coach Shannon Schweyen. “Road wins are going to be big for anyone to get in this league. Indeed. Heroes were aplenty for the Lady Griz, who had five players in double figures, including a pair of freshmen in Katie Mayhue and Carmen Gfeller, who combined for 29 points off the bench, with Mayhue going 5 for 10 from the arc to score 17 big points. Jace Henderson, with 17 points, 10 rebounds and seven assists, and Gabi Harrington, with 18 points and 10 boards, both posted double-doubles for the second straight game, and McKenzie Johnston shook off the effects of a re-broken nose to put up 16 points, eight rebounds and five assists. It was the happy ending Montana wanted, but it came after a nightmarish start, filled with turnovers and missed shots and double-digit deficits throughout the first and second quarters. The Lady Griz opened by playing just the way the Hornets, who led by 10 less than seven minutes in, wanted. It was Mayhue, who hit three 3-pointers in the second quarter, who kept Montana in the game, when it felt like the Hornets were on the verge of doing to the Lady Griz what they’d done the last five seasons at The Nest. Her triple with two minutes to go before the halftime break cut a 10-point lead to seven, and she was on the floor in the final minute, when Montana cut a nine-point lead to four to take some momentum to the locker room, trailing just 38-34. Mayhue’s heady lead pass to Harrington for a layup made it 38-31, and with Sacramento State playing for the half’s final shot and looking to the bench for instructions, Harrington shrewdly snuck up on the Hornets’ Gabi Bade and tied her up with just seconds to go. That gave the ball to Montana, and Mayhue, taking over ball-handling duties for Johnston after she left the game in the second quarter, did it again, hitting a triple at the buzzer to give the Lady Griz a jolt of energy after what had been a mostly ho-hum opening 20 minutes. If the second quarter belonged to Mayhue, the third was owned by Gfeller, who roamed the elbow area and attacked every time she touched the ball. Not the rim, just gaps to find open space for her textbook jumper. When she’s on, that’s as sure a thing as a layup. She hit three jumpers in less than a minute and a half to give Montana its first lead of the game, 44-43. And still, Montana trailed by seven, 61-54, with just over four minutes left in the fourth quarter. Schweyen’s first two teams likely would have been done at that point. Not this one, partly because of the experiences of the last two years and partly because of those precocious freshmen. Mayhue hit what was probably the shot of the game for Montana when she connected on another 3-pointer that made it 61-57 and gave the Lady Griz life. That started a 9-0 run that gave Montana the lead. It became a 13-2 surge when McKenzie Johnston, back in the game and sporting a mask, went reverse on a layup to make it 67-63 with just 24 seconds left. But no lead is safe in The Nest, not when it’s the Hornets who are down. Kennedy Nicholas scored inside with 11 seconds left, and Montana only made one of two free throws with 9.2 seconds to go, when two probably would have secured the victory. Montana, leading 68-65, had two fouls to give but nobody dared use them, for right or for wrong. And Sarah Abney, she of eight made threes to that point this season, emerged from a scramble in front of the Hornet bench and banked in a shot at the horn that was confirmed to be good after video review. “It kind of fits being in here at The Nest. This is kind of what happens here a lot,” said Schweyen, who informed her players before the final play of regulation that they had fouls to give but left it up to them to use their best discretion. Montana built a four-point lead in the opening overtime, but that evaporated in less than a minute when Abney — again! — and Gabi Bade hit back-to-back 3-pointers to give the Hornets the lead. Sacramento State went 11 for 26 from the arc for the game, surprising, but not really, for a team shooting less than 24 percent from distance through its first nine games. “That’s what I told our guys,” said Schweyen. “They may not be shooting the ball well statistically, but when they’re at home, you have to pretty much throw that out the window. Johnston tied it at 78-78 in the final minute of overtime, and both teams missed opportunities to win it in the final 10 seconds. Fittingly, it was Gfeller and Mayhue who put Montana up for good in the second overtime, with Gfeller hitting a jumper with 3:20 to go that made it 80-79 and Mayhue hitting her final triple to make it 83-79. Bade, who finished with 26 points on 6-of-10 shooting from the arc, answered right back with a three of her own, but Montana answered every Hornet threat. First it was Harrington, then it was Johnston at the line. Then it was simply good fortune. After Johnston missed twice at the line with 12.2 seconds to go and Montana clinging to an 87-86 lead, Sacramento State got the ball inside to Nicholas, and her jumper from four feet hung on the front of the rim for what felt like two full seconds before falling off. Harrington hit one of two free throws at the other end for the game’s final margin. “That’s how it goes,” said Schweyen, of Sacramento State’s potential game-winner. “I thought we had a lot of things that didn’t quite go our way as well. For as deep as Montana is, it was Henderson (48 minutes), Harrington (43) and Mayhue (42) who carried a big load on Thursday. It was just impossible for Schweyen to take them off the court with what they were doing. Even Johnston, who went down in the second quarter after taking a charge, ended up playing 36 minutes when most players would have taken their throbbing nose and watering eyes and taken a seat at the end of the bench. It was Henderson’s fourth consecutive game with a double-double, and her seven assists upped her team-leading total to 53. Harrington made it two straight games with a double-double. “Gabi’s rebounding is why she’s on the floor for 43 minutes. It’s hard to not have her out there with what she’s doing,” said Schweyen. “And Jace did a fantastic job keeping her composure and finding the right people when they were doubling her in the post. She has a great knack for finding the right person. Montana, tied atop the league standings with Idaho, which had no trouble with Eastern Washington on Thursday night in Moscow, will play at Portland State (9-2, 1-1 BSC) on Saturday at 3 p.m. (MT). The Vikings trailed Montana State 16-0 and 20-2 in the first quarter at home on Thursday but rallied to win 55-53, their only lead on the night coming with 5.3 seconds remaining on two Ashley Bolston free throws.